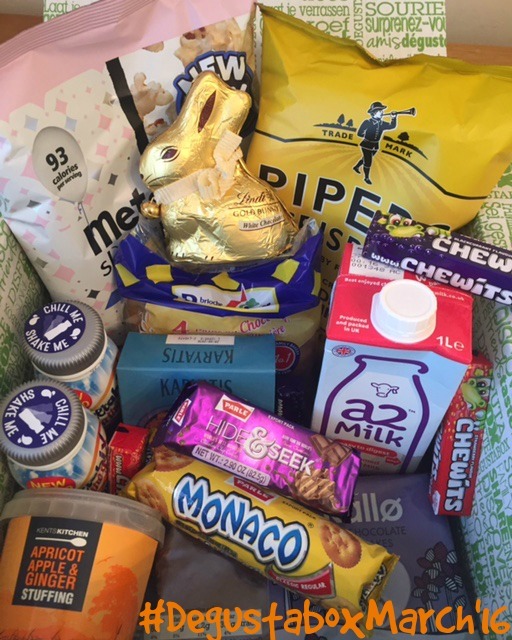 Just in time for the long Easter weekend our March Degustabox was delivered with some rather yummy Easter treats for us! 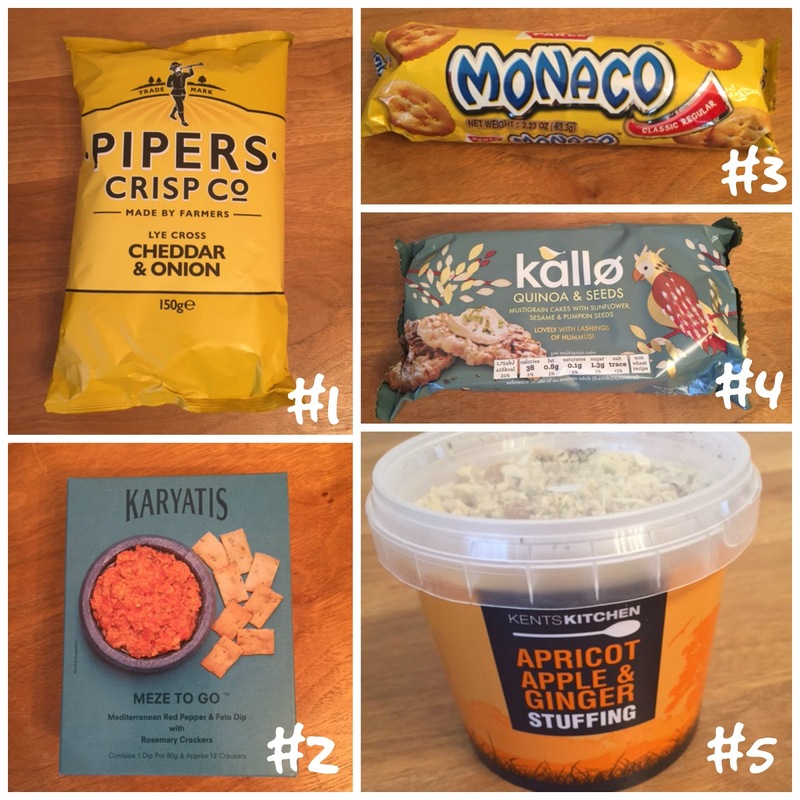 #1 Pipers Crisps endeavours to make Britain’s tastiest potato crisps. They have won 23 Gold Great Taste Awards and have been voted “Best Snack Brand” by the readers of Fine Food Digest 4 times. I loved the rich Cheese & Onion flavour of those although the texture was a bit hard for my liking. #2 Karyatis Meze To Go brings a taste of the Mediterranean to your everyday snacking. A delicious sweet & smokey roasted red peppers and tangy feta dip, perfectly complimented by crunchy rosemary crackers, all packed in an easy-to-carry box. The perfect little picnic treat, i loved the flavour of the dip but the crackers had a bit too much of a crunch to them once again its my personal liking of softer biscuits. you can add to your ordinary boring moments. Those rather crunchy savoury biscuits tasted grant with some creme cheese on top! We don’t think eating sensibly has to mean saying no to the things you love. We’ve developed these delicious Multigrain cakes with sunflower, sesame and pumpkin seeds perfect for snacking on their own or top with your favourite ingredients for a lovely light lunch. I enjoyed them as a light mid morning snack with some creme cheese on top! #5 Kent’s Kitchen stuffing’s are a tasty addition to a roast dinner. Made with all natural ingredients and chunky pieces of fruit, herbs and spices, these easy to make stuffing’s will complete your meal. Just add water, stir, bake and serve the delicious stuffing for an added taste explosion. Each pot serves four people. Now that sound great and i cant wait to try these out when we cook our next family roast! #6 These NEW Pains au Chocolat contain a generous helping of delicious crème pâtissière. Individually wrapped, they are ideal for breakfast on the go or as a snack. Free from preservatives, hydrogenated fats and artificial colours. Can be enjoyed warm. Pre-heat your oven to 200 C and warm product for 2-3 minutes. I really should read the instructions! I bet they taste even more delicious heated up but the kids and me where happy to eat them just like that out of the package! #7 Indulge in the mouth-watering delight of India’s best moulded choc chip Hide&Seek biscuits. Well that’s just what i did and how delightful they where! Shame they don’t come in large sizes! #8 At Kallo, we believe smooth Belgian chocolate and puffed wholegrain rice is a combination not to be messed with. So we don’t. Keep snacking simple with our delicious Chocolate Rice Cake rounds, and with 78 calories per cake, they are the perfect sweet treat. These are by far the BEST chocolate coated rice cakes i have ever eaten and i am a huge fan so much so that i didn’t share them with the kids!! #9 Chewits were one of the first chewy sweets to hit the streets! Like those who chew them, they’re great fun and a little bit cheeky. In the 50 years they’ve been around they’ve had some sweet success and remain an iconic British confectionery brand still loved by the nation today. Who doesnt love chewy sweets! Both flavours tasted lush and they will show up on my shopping list again that’s for sure! #10 Discover the delicious Lindt White Chocolate Gold Bunny 100g, made by the Lindt Master Chocolatiers this Easter. Whats not to like! I adore anything from the Lindt Range and white chocolate happens to be my favourite so this has to be my favourite item in this month box!! #11 Metcalfe’s skinny’s newest addition to the popcorn family, Cinema Sweet! Sweetened with natural stevia leaf extract, Metcalfe’s skinny are the first to introduce this delicious and unique popcorn, which has 67% less sugar than all other sweet varieties on the market. With only 93 calories per serving, say hello to guilt free munching! I love popcorn but i am always swayed if i shall go for sweet in the cinema because its just that tad too sweet for me! So i am loving the taste of the new Metcalfe’s cinema sweet just right for me!! 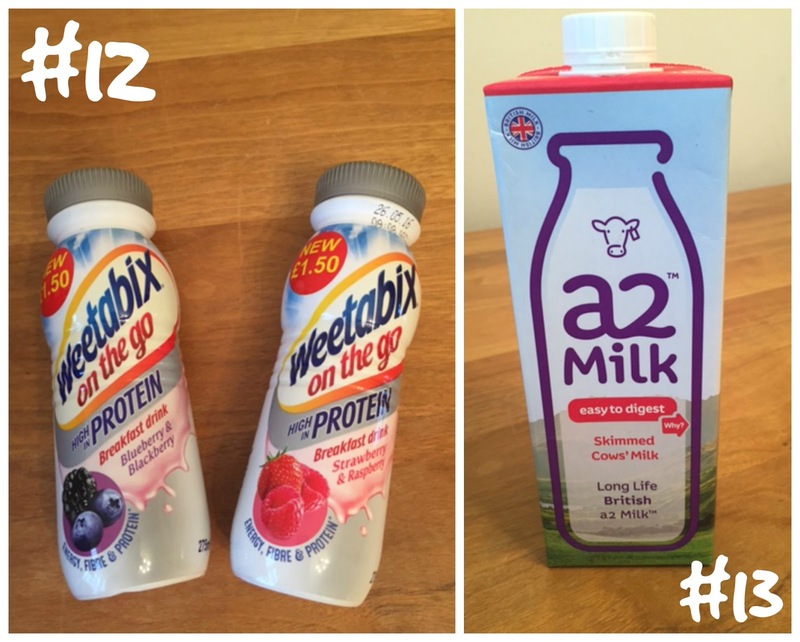 #12 Weetabix On The Go Breakfast Drink with extra Protein delivers a proper breakfast that fits your morning routine because it contains all the energy and fibre of a Weetabix cereal with milk in an ultra-convenient, smooth and tasty drink. Plus its packed with an extra 20g of Protein per serve to keep you feeling full, energised and ready for the day ahead. It also contains 4 vitamins, iron and calcium and absolutely no artificial colours, flavours, preservatives or sweeteners. This wasn’t for me the flavour was OK but i am just not a huge Protein Drinker. #13 a2 Milk™ is pure cows’ milk that feels better in your body. Unlike regular milk, it naturally contains only the easy to digest A2 protein. 100% free-from the inflammatory A1 protein – guaranteed. I am yet to try this but i have heard about this brand a few years back at BritMums Live and really like the sound of it! 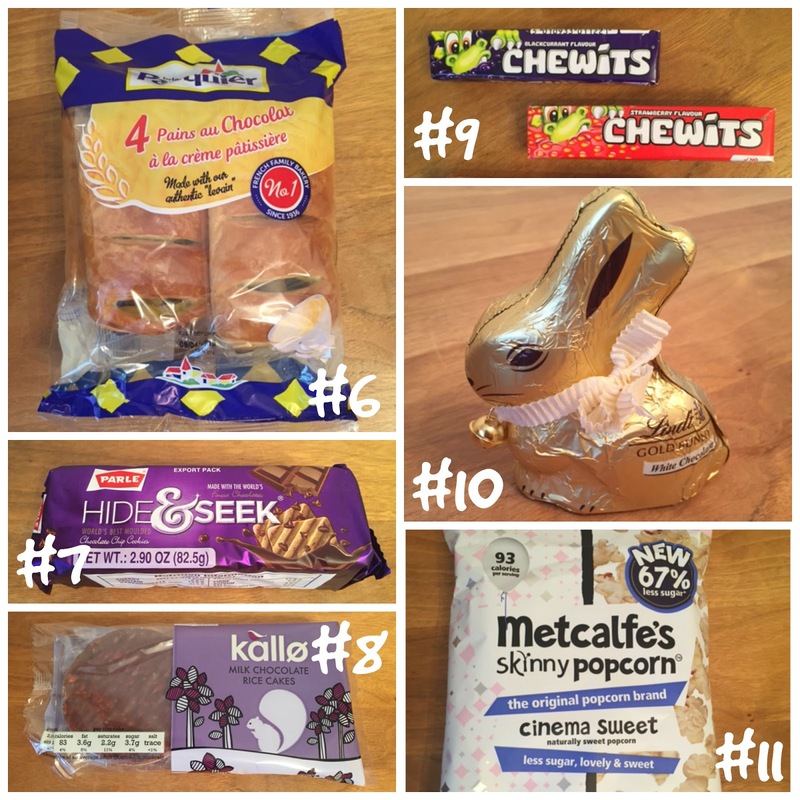 Overall we liked 10 items out of the 12 in the Box, well that’s the highest score we had for ages and i must say the variety of this month box was just perfect! Well done Degustabox!! Disclaimer: I have been sent the March Degustabox for reviewing purposes, but all thoughts and opinions are mine.